Kudos to my amazingly talented neighbor, Carmen, who made this wonderful tiramisu trifle for me and my family. Two weeks ago, I interviewed Carmen as part of the resident recipe article I write for our monthly neighborhood magazine. I was so impressed with her delicious creation, that I had to share it with you sooner than later! Carmen’s family loves tiramisu but she has never been a real fan. After experimenting with a lot of recipes, she finally came up with one that all of her family liked! She started to make it the traditional way with lady fingers, but found they are really hard to find in a regular grocery store. One day, when Carmen couldn’t find lady fingers, she had some homemade biscotti and decided to try using them instead of the lady fingers. That inspired her to make many other “twitches” in the recipe! It instantly became a crowd favorite!! This tiramisu is the ultimate, most decadent and delicious dessert. It’s perfect for a crowd, and while it takes a little patience to make, it’s definitely worth it. 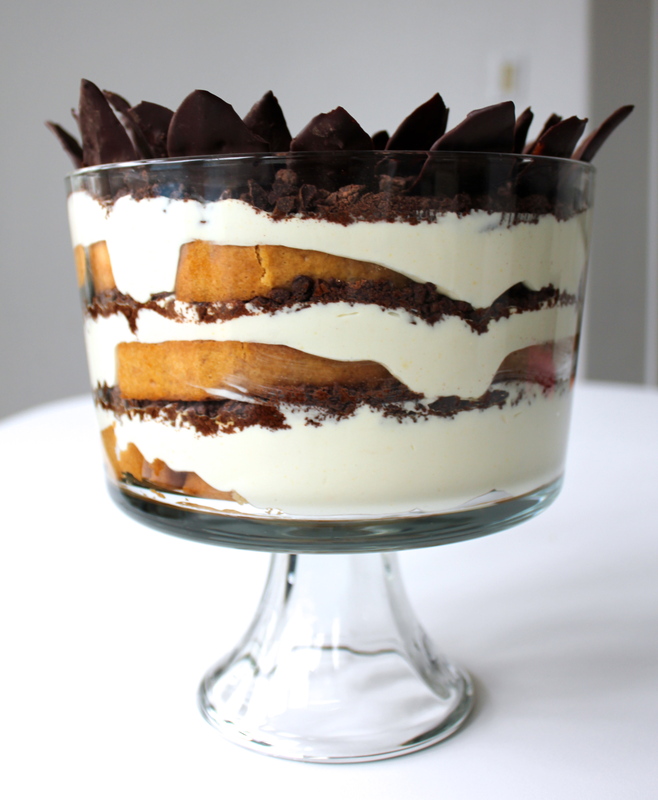 I give Carmen’s Tiramisu Trifle two thumbs up… I’d give it more if I had more thumbs!! FOR THE MASCARPONE CUSTARD: Whisk sugar, water, vanilla extract and egg yolks in a metal bowl. Set bowl "a bain marie" - over simmering water. Whisk until mixture thickens for about 5 minutes. Remove bowl from over water. Whisk mascarpone, 1 container at a time, into warm custard until blended. Beat whipping cream with almond extract until cream forms soft peaks. Fold in mascarpone custard. FOR DIPPED BISCOTTI: Mix warm water, expresso and coffee liqueur. Dip biscotti in coffee mixture to coat on both sides. FOR CHOCOLATE LEAVES: Wipe and dry leaves. Melt chocolate in microwave 30 seconds at a time, mixing after each 30 seconds, until chocolate is completely melted. Brush chocolate over the bottom side of the leaves until coated. Place leaves on a baking sheet covered with parchment paper. Chill until firm. Carefully peel chocolate from leaves. TO ASSEMBLE: Cover bottom of trifle dish with dipped biscotti. Spread about 2 cups of the mascarpone custard to cover biscotti. Sprinkle with ground chocolate chips. Repeat layers until you reach top of dish. Cover and chill for a couple of hours or until ready to serve. 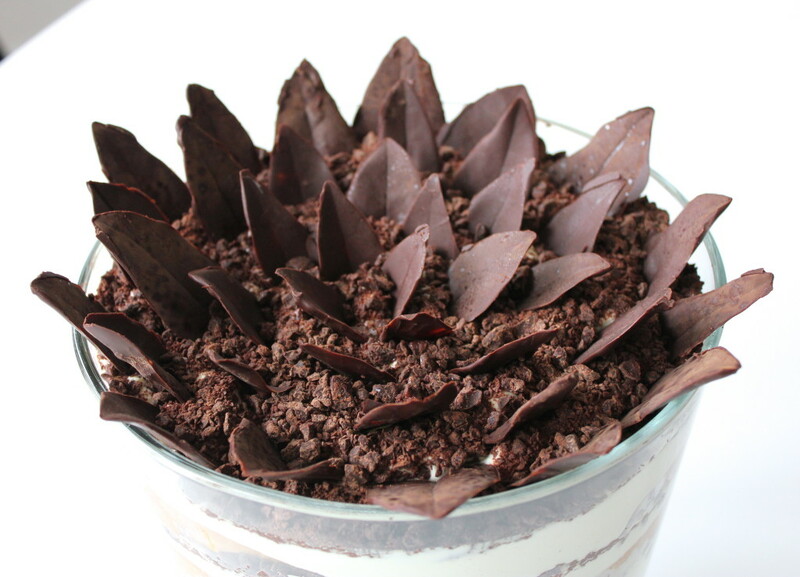 When ready to serve, decorate with chocolate leaves.